This hotel is just 6 miles from the airport and a 20-minute drive to downtown. Take a trip to Banff National Park, discover the Rocky Mountains, or stop by the Telus Science Center. After a day of exploring, unwind in comfortable accommodations featuring a 37" HDTV, WiFi and more. 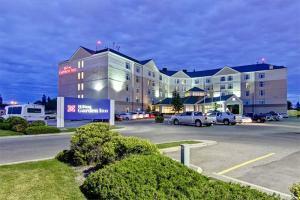 Located about 6 miles from Calgary International Airport.